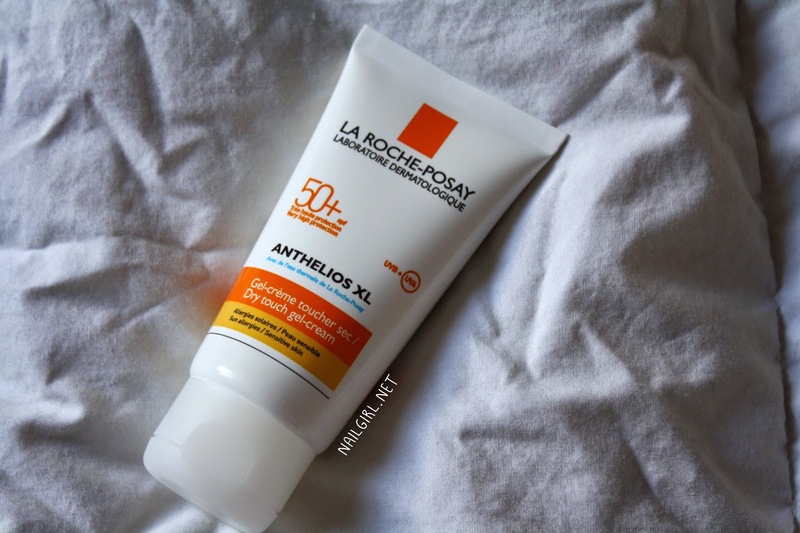 La Roche-Posay Anthelios SPF50+ Dry Touch Gel-Cream (Whew! What a mouthful) is a very high protection sunscreen with not only a high SPF rating, but a high PPD (Persistant Pigment Darkening) rating of 31. This means that it has very good protection against UVA, which is the type of UV light linked to skin aging and sunspots. It's also a combination sunscreen, meaning it uses both chemical sunscreens and physical sunscreens to protect your skin. I thought I would try it, since it is described as ideal for combination to oily skin. It has a creamy, sort of thick texture - thick in the way that when I turned my hand upside down with it on it, it didn't drip or slide off immeadiately. I thought some might find it helpful to see the full list of ingredients, so I've listed it below and indicated which ingredients are sunscreens. It's also fragrance-free, paraben-free, and non-comedogenic. So how did I like this sunscreen? Well, frankly I don't like it much. When I use it, I don't find that any of the claims of "double anti-shine action, immediate absorption, ultra-dry finish, no white marks"are fulfilled. My skin is certainly not more oily when I use this product, but it's not any less oily either. While the finish is not heavy, I don't know if it's what I would call a 'dry' finish. It's smooth, but not as dry as other sunscreens I've tried. Also, I find it impossible to apply the correct amount (1/2 tsp for face + neck, or 2mg/cm2) without white streaks everywhere. I suppose it's not so bad if you are planning to wear makeup over the top of it, but I just don't have time for that every morning before going to uni. The texture also makes it such a PITA to apply. I usually apply sunscreen by rubbing the amount I want to use in my hands, then patting it all over my face. This is not possible with this product as it requires rubbing in to mitigate the white cast. What I do instead is apply it to one part of my face at a time to avoid excessive rubbing (which HURTS on active pimples!). Unfortunately, there is just no way for me to apply this for full protection without having a streaky whiteface on. Even when I apply less, there is still a visible white cast on my face, making me look paler than I am. After rubbing it in and waiting for a few minutes. You can see that on the back of my hand, there's definitely a difference between the skin there compared to my arm. I would only recommend this product to people who are fairer than myself, with slightly drier skin. Overall, I give this product 2 out of 5 polishes. I purchased this product from Escentual.com.